Plants annual. Culms (3)10-60 cm, prostrate or erect, round or somewhat compressed, often highly branched; internodes hollow. Sheaths glabrous (rarely sparsely pilose near the base), sometimes with a sticky exudate; ligules 1.2-2.5 mm, truncate, erose to lacerate; blades 1-15 cm long, 1.2-5.5 mm wide, glabrous abaxially and adaxially. Panicles 2-17 cm, with 5-23 racemose branches; branches 1-2.5(3.5) cm, stiff, often included in the upper leaf sheaths. Spikelets 4.5-7.5 mm, more or less imbricate, magenta or green, with 2-6 florets. Glumes triangular, acute; lower glumes 1.6-2 mm, acute; upper glumes 2-2.9 mm; lemmas 2.4-3.5 mm, ovate, membranous, sericeous along the lower veins, lateral veins pronounced, apices acute, obtuse, or truncate, awned, awns 0.5-1.5 mm; paleas minutely scabrous along the veins; anthers 3, 0.4-0.5 mm. Caryopses 1.2-1.6 mm long, 0.4-0.5 mm wide, narrowly elliptic to obovate, transversely elliptic in cross section. 2n = 40. Leptochloa viscida is a Sonoran Desert species that occurs from southern California to southwestern New Mexico and south into adjacent Mexico. It differs from L. fusca subsp. 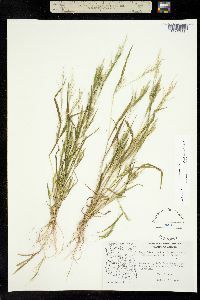 fascicularis, which grows in the same region, in its consistently short-awned lemmas, smaller panicles, often prostrate and much-branched growth habit, and often reddish florets. Common Name: sticky sprangletop Duration: Annual Nativity: Native Lifeform: Graminoid General: Cespitose annual grass, stems low and spreading to erect, 10-60 cm long; internodes hollow; herbage viscid (sticky or gummy). 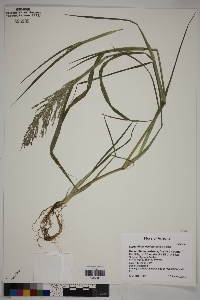 Vegetative: Blades flat, 2-15 cm long, 2-6 mm wide; sheaths scabrous; ligules membranous, 1-3 mm long, minutely jagged. Inflorescence: Dense panicle 3-8 cm long, branches ascending to appressed for the lower 1-2 cm, with 2 rows of spikelets. Spikelets round in cross-section, 4-6 mm long, with 4-8 florets; glumes 2 mm long, the lower glumes triangular, upper glumes larger and wider than the lower; florets red, sticky; lemmas 1.5-3 mm long, ovate, with rounded, with viscid backs and hairy veins, the apices minutely 2-lobed with slender awns 0.5-1 mm long; the spikelet axis breaking apart above the glumes and between the florets. Ecology: Found in wet places, open ground and waste places, from 1,000-3,500 ft (305-1067 m); flowering June-October. Distribution: s AZ, s CA, s NM, sw TX; south to N MEX. Notes: Distinguished from Leptochloa fusca (Dinebra fusca) and Leptochloa panicea (Dinebra panicea), two other Sonoran Desert annuals, by its short-awned lemmas, small dense panicles, and often prostrate and much branched habit with reddish florets. L. fusca has whitish spikelets, panicles 10-105 cm long, and lemmas that are awnless or mucronate. 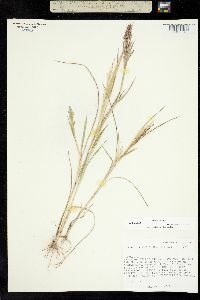 L. panicea also has larger panicles 8-30 cm long, with filiform, widely spaced branches, awnless lemmas, and, notably, spikelets that can be green or red. Ethnobotany: Unknown. 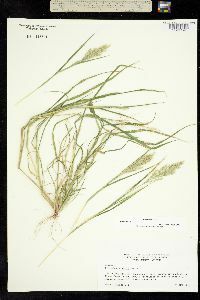 Synonyms: Diplachne viscida, Leptochloa viscida Editor: LCrumbacher 2012, FSCoburn 2015, AHazelton 2015 Etymology: Leptochloa comes from the Greek leptos, "slender," and chloe or chloa, "grass"; viscida means viscid, describing the small, sticky globules of brown, viscid liquid on the ends of the hairs on the stem.